Don’t you just love it when you want to make a certain recipe and you just so happen to have all the ingredients needed on hand? Yep, that’s how this chicken salad came to be. Thanks to our overly ambitious food shopping habits, we are stocked to the roof with fruits, vegetables, and even rotisserie chicken! This is one of my favorite ways to eat chicken salad. I happen to like this stuff many different ways – the traditional way, with mayo and a hint of celery is good. I also used to have it with apples and raisins all the time when I worked in the city years ago. I thought it was a weird combo when I first heard of it, but I liked it immediately when I tried it. I’m one of those people who likes the salt-sweet combo of things like chocolate covered pretzels or a simple mango chicken saute with veggies. This chicken salad is lightened up by using Greek yogurt in place of mayonnaise. Of course, if you’re not a fan of Greek yogurt, mayonnaise works too. Just mix up all the ingredients and serve. Even faster if you have some precooked chicken to use up! 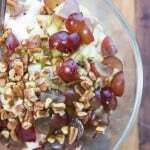 Mix all yogurt, vinegar, honey, and sesame seeds in bowel and refrigerate until ready to dress the salad. Grill chicken breast over medium high heat until cooked through then cool at room temperature for 10 minutes before refrigerating. When the chicken is cold, dice into bite-size chunks, transfer to a large bowl. 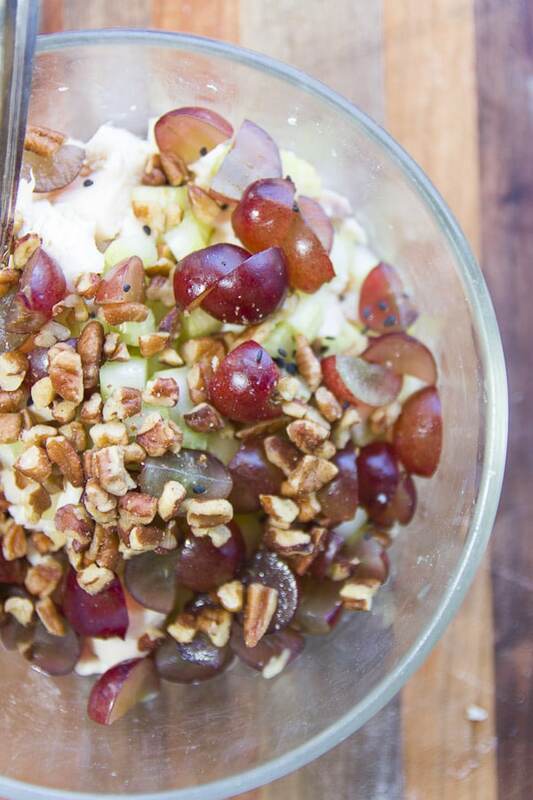 Combine chicken with pecans, grapes, celery and dressing. Serve with multigrain bread or over fresh lettuce of your choice. Use rotisserie chicken or leftover chicken breast to save time.